VILLAS AND APARTMENTS TO RENT IN FRIGILIANA, SPAIN. 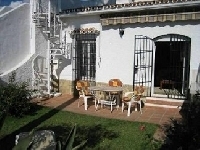 Welcome to our selection of holiday homes to rent in Frigiliana, Spain. Frigiliana is one of the many whitewashed villages that dot the countryside and hills behind Malaga and the rest of the Costa del Sol. Tourists staying in the beach resorts can enjoy day trips to visit this pretty town or you can choose to stay in one of the small hotels and guest houses to explore the rest of the region more fully. Frigiliana itself was once a Roman settlement, though little of the original town now remains, and you are advised to leave your car at the parking area near the entrance to the town and explore the narrow streets on foot. Although it is only a small town, Frigiliana is used to the presence of tourists and day trippers and has a wide selection of bars and restaurants where you can get refreshments or meals, usually during the day or early evening. Once you have climbed through the winding streets, appreciating the tiny white houses with the flowering balconies, you will reach the Mirador which opens up to offer great views in all directions; north to the mountains as well as south to the Mediterranean. There are even a couple of bars in the Mirador area, so you can rest after your climb and enjoy a drink while you savour the view. Of course, in the summer you may have to wait a while for one of these outside tables to become free! There are a few shops in Frigiliana too which cater to the tourist market, selling souvenirs as well as local crafts and produce. Frigiliana is on the edge of the Almijara Natural Park, an area of outstanding natural beauty which is popular with hikers and bird lovers alike. There are even equestrian centres in the area where you can join day-long pony trekking trips to explore the hills, often with a picnic included in the price! For tourists who are a bit more active, there are mountain biking trails in the hills too. The coastal town of Nerja is well worth a visit if you are staying in the Frigiliana region. Not only does it have pleasant beaches and all the amenities that a larger resort can offer. It is also home to a spectacular 19th century aqueduct and the impressive Caves de Nerja. This network of caves stretches far underground and have not yet been fully explored. Some parts of the caves should only be explored by experts with safety equipment, but some areas have been made safe for tourists to visit, with well-lit pathways. There are even concerts held in the underground amphitheatre in the summer months. Looking for self catering holiday accommodation in Frigiliana? Then below is a selection of holiday villas in Frigiliana and holiday apartments in Frigiliana that can be rented direct from their owners. You can either click on each listing for further details or you can use our search engine on the left if you are looking for something in particular. Nerja Caves - The Nerja caves are located just three miles down the coast to the east. There are a number of artefacts in which the cave processes such as wall paintings dated back to the Palaeolithic and post-Palaeolithic periods and also contains skeletal remains such as a human skeleton and animal bone fragments, which are believed to have inhabited the caves as far back as 25,000bc. Archaeological Museum - The Frigiliana Archaeological Museum has a collection of artifacts found at several different sites around the area. The museum will take you on a tour through the town�s rich heritage. Even the museum itself is located within a landmark building which is The Apero, a seventeenth century building. Nearest airport - Malaga Airport is the nearest airport at 45km's away. Frigiliana is one of the many-whitewashed villages spread out around the countryside and hills behind Malaga and the Costa del Sol meaning any visitors can easily go on a day trip to Frigiliana. The town was once a roman settlement, and even though not much of the original town still stands, you are still advised to park your car at the town entrance and walk the street, as they are very narrow.